I look at the cartoon shows of today and I think that cartoons from before were way better. This is why I can't help but feel happy that some of the cartoons from when I was growing up are making a comeback. Recently re-launched is CBN's Superbook. 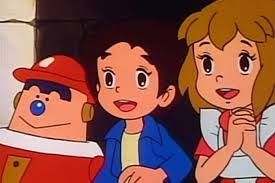 The show follows main characters Chris, Joy and Gizmo (the robot) as they travel to the time of the New and the Old Testaments of the Bible (the Superbook). Each story ends with a valuable Christian lesson that kids can pick up. It's a great way to teach young kids about the Gospel. After more than a decade, this lovable show is back with a brand new look and name, Superbook Reimagined. Since it aired last June, Superbook has gained a new set of followers who are called Batang Superbook. Last week, my family and I joined these Batang Superbook at the Batang Superbook: Bida ng Pagbabago Roadshow. The show was hosted by Superbook agent and mommy Bettina Carlos. It was a fun-filled event full of games, singing and dancing. There was even a magic show and also a film showing of one of their episodes. Henry also got a chance to have his picture taken with Gizmo the Robot. The roadshow was a great way to introduce Superbook to Henry. He's now really excited to wake up early on weekends just to catch the show. You too can catch Superbook every weekend on GMA 7 at 7:30 in the morning. For more info about Superbook, visit http://www.batangsuperbook.com. You can also like them on Facebook or follow them on Twitter (@BatangSuperbook).